Performing Lute Suites is another string to Michael Poll's rare guitar! All guitars have six or twelve strings, right? 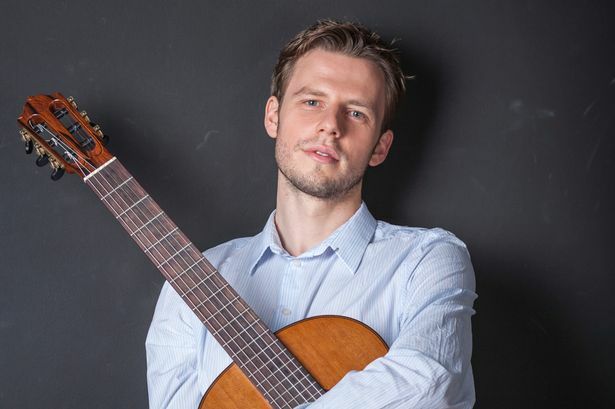 Not true, as the audience at the Elgar Hall in Birmingham University’s Bramall Music Building on May 11 will have the chance to experience, when Michael Poll performs Bach’s Lute Suites on a seven-string guitar. The instrument shows up in folk traditions in Brazil and Russia, but in terms of more serious matter, “the idea to play on seven strings came from the repertoire itself”, Michael tells me. “I realised in 2013 that just one additional string, providing five extra bass notes, would be enough to play the lute suites almost exactly as written. This started me on the quest for an instrument. My 6-string guitar was made in 1995 by the eminent luthier Robert Ruck for the legendary Manuel Barrueco, but I had always hoped that someday I would have one made for me – and the need for a seventh string provided the perfect opportunity. So I’m incredibly lucky to be one of the very few people in the world to have a Ruck 7-string instrument. But are these Bach Suites playable on conventional lutes? Michael’s recording of the Lute Suites on his seven-string guitar was released last month, and he goes into perhaps painful detail about the actual performing process. “I’m a guitarist and so play the suites on the guitar (playing on the lute would involve lopping off the nails on my right hand since nails get stuck on the double string courses of the lute.) But in my approach it’s a mix of looking back for inspiration in terms of instrumental range, pitch height (I recorded the suites at A=420), and approach from the past while working on a modern instrument that is familiar in the world today. And Bach himself had a vested interest in the lute, as Michael explains. Michael goes on to enthuse about this seven-string guitar enterprise. “The project seems to be resonating with people (it now has over 200,000 streams on Spotify and 50,000 weekly listeners) and so I’m particularly excited that people who are coming into contact with the project seem to be enjoying it. “That part is a dream come true for someone like me who spends so much time researching and planning and practicing. It was the aesthetic imperative of 18th-century musicians to arouse ‘passions’ in people; audience engagement was super-important to them. So it’s great that this music is finding such a warm reception among a new generation of internet audiences. Michael Poll’s recording of Bach’s Lute Suites is available on Orchid Classicas. He performs at Coventry Cathedral on May 9 (7.30pm), and at the Elgar Hall, University of Birmingham on May 11 (7.30pm).